Right now I'm enjoying my yearly week of summer vacations. Unlike on my daily routine, I'm able to get some rest, and sleep like an actual human being. The downside, is that I have limited internet connectivity where I'm staying. After enjoying the beach with my family, I get some time to spend on the project. And without internet (and cat videos), I was able to finally sit down and learn proper spriting in Photoshop. Paint Shop Pro was very good when the project started, but Photoshop is a completely different beast, and many things are more comfortable once you learn some keyboard shortcuts. I could finish the sprites for the last couple enemies that were pending. They can still be improved, but they are useful for coding the AI and placing them in the game. I'll be returning home in a couple days. By then, I'll post some screenshots of the latest changes. I'm happy to see you are enjoying yourself while on vacation. I can't wait to see the final game. This game is just a masterpiece already. take your time, all you want. Ooh....super jealous right now! Wish I could escape to a warm sunny beach for a week or two, just enough to escape the cold and snow here in the mid-Atlantic. I'm glad you've gotten some time to enjoy yourself, Doc! As well as brushing up on some PS skills. I'm not a major fan of PS myself; at least, not the one on my computer (it's slow as molasses, and hates me). Can't wait till the project is finished! You're on holiday, for once I'm going to say you shouldn't be doing any work! Enjoy yourself instead. I'm glad to hear that you taking plenty of time to relieve your stress and relax with your family and friends. We all know that you have been working hard on this project for a long time, luckily there are tons of individuals through out these years who would give you assistance with spriting, composing soundtracks and play testing for your game. Even simple comments like these can show how much we cheer you on with all of your hard work and dedication as we all are looking forward to you reaching your goals, getting your project closer to completion and becoming something truly incredible! Cool! It's great to see that this project has come so far, and been one of the few that managed to stay standing to the end! I can't wait to see the new stuff, but make sure that you take your time and get some good rest, first! Enjoy your vacation Doc! Can't wait to see what you come up with once you're back into the swing of things. It's good to get a break every now and again. But it's also great to know when progress is being made. Good luck! It's good to hear that you're having some time off now, enjoy it to the fullest and don't worry ^w^ you've more than earned some time off for yourself. main thing is you're safe and happy. Have a lovely Holiday Doc. I hope that you're enjoying your holiday Doc. You deserve it after all this. I have to say that you've made me try out Game Maker. I've known about it before, but I just wasn't interested in it. But after I saw your work (mostly after version 1.4) and after I read that you made it on Game Maker, I just couldn't resist not to try it out. Have a great time with your family! It really exciting for you to be working on the sprites in the game because it makes it one step closer to the finished version of AM2R and it's cool to animate them to make the characters/creatures to move! Glad to hear you've been taking some time to enjoy yourself! It's very important that you can stick to your own schedule and not the schedule that others might try to lay out for you. Looking forward to see what you show next. looking forward on your next game update once you come back. Glad to hear you can get some time off, enjoy your break! You deserve it. Hey Doc or anyone else that knows; When you get the chance can you reply with the name of the program that you use for creating the soundtrack and such for AM2R? Would greatly appreciate it! I've never commented before- but- I feel the need- thank you so much for doing this! This project is a really fantastic thing, and I, like a lot of people for sure, are very grateful to you for all your hard work. I absolutely cannot wait for the final product (that said- take your time! ), as this is one of the most enjoyable games I've played in a while. I've been keeping up with the project about a year, I'd say, and every update or post lifts my spirits. Keep up the good work, man! And enjoy your vacation. You totally deserve some rest. I only recently discovered just how long you've been pursuing this project, and it's extraordinary. Though, if you're doing spriting-related work, I'd just like to leave a tiny bit of feedback on Samus herself. I don't know if you're finished with her, but something that, to me, is somewhat jarring, is the lack of minor movement she has. In Zero Mission, she shifts very slightly when standing still, and her body shifts back a little bit when she fires the Arm Cannon. It's a very small detail, though, and AM2R is beyond spectacular without it. I wouldn't doubt I'm the only who even has a problem with this, but it's the most feedback I have to give. You've done just such a good job! After all this wonderful progress you deserve a break. We'll be patient like we always have and appreciate all the hard work your putting into this. Enjoy your Vacation! He lives! Well whenever you release the next update prepare that game cuz im gonna play the living crap out of it! Thanks and good work! Hope you resto ando relax! I'm a follower since this project was begining, and is proud to say, that this game will be so cool when released, I know it ! I've to said but i'm being collecting all versions of the demo, even when it was released metroid confrontation XD, I hope to see it, play it , taste it haha the release of the full game, also playing in my big screen yeah. Have a nice vacations Dr. ! The release of the game will be more epic than SSJ4 Goku! This game is close to perfection. I'm 100% positive that you'll nail it but don't rush through the end of this. I hope you enjoyed your holidays. There's nothing more important than a break every now and then. The work you've done is simply astounding. I've never played a 2D Metroid game with controls this good. Now that the morph ball is at the touch of a button, traversing and combat are better than ever. At the moment my only gripe with the entire project is the item fanfare. My favorite has always been the one in Super Metroid, as it's the least uplifting one. I like the ominous atmosphere, and I feel the item fanfare as it is now simply shatters the atmosphere. I hope your vacation was restful man! Genial Dock ya se me hacia raro que no publicaran la de enero xD, espero la estes pasando de maravilla con tu familia! yo igual estuve de viaje regrese no hace mucho, un largo camino recorrido hasta ahora eh? pero no dire las ultimas palabras hasta que salga el PROYECTO FINAL! nos vemos despues dock ansioso esperare esas imagenes saludos a toda tu Familia! I am waiting since 2008. I hope the game will be released in the near future. Hope this isn't an excuse to finish the project, taking time is one thing, don't let it turn into too much time, and before the fansboys start attacking I'll say that I know what I'm talking about, simple tasks can quickly turn into full on excuses to not finish. I played metroid confrontation and it was so fun, im waiting patiently for the big desert and officially a count down for me cuz your...kinda overdue. I ave all the time in the world for it anyway, make it good and take the time you need. I just heard about this awhile ago and I have been following every sense. I am glad you're taking time to rest. I have tried the Demo yet because all I have is a chromebook and couldn't figure out how to instal it on linux. I have been a fan of Metroid for a long time and this looks to me and feels to me like a real Metroid game. kickass. keep it up, this is the best metroid game I've played in years, and that's a fact. This game looks already like a masterpiece. Can't wait to play the final version... thats if we ever see it happen. Just not too long ago we had Project M, one of the best free software hacks for Super Smash Bros. Brawl got shut down by Nintendo. Apparently they were approached by Nintendo officials and were threatened by lawsuits. I imagine stating that they were probably hurting sales of the Wii U Version of the game and using characters and stages that were to be released as purchasable downloadable content in the future, example...(Roy, Mewtwo, Dreamland stage). Let me remind you that the hack was free. So... the same fate could happen to this project also. Especially the fact that they seem to be on a remake rampage these days, for example... revamping the graphics to a good number of it's Zelda's and re releasing them on Wii U and 3DS. Metroid is one of their major franchises, and Metroid 2 The Return Of Samus on gameboy has never been remade yet. I'm pretty sure they'l want to remake this one someday. Metroid 1 got remade as Metroid Zero Mission and sold really well, so why wouldin't they remake this one. It's easy money since they already have the blueprints... so to speak... of the game. They'd be fools not to. All fans are screaming for it ( I mean those who aren't aware of this project). I don't want to put pressure on anyone but the longer this project is left unfunished, it will be kept in constant danger of being shut down by Nintendo. All it will take is for them to wake up one day and decide they've had enough of their screaming and moaning Metroid fans, and actually make the remake. At this point, they'l approach the creator of this project and threaten him of lawsuits stating that it would hurt their remakes sales or some Bull**it like that. Anyways heres hoping that this will never happen. To Benjamin Descormiers, this is totally different, though. That was a hack of an existing game, in that it utilized software that Nintendo had licensed, copyrighted, owned, etc. It was a modification of an already existing program which is the intellectual property of its parent company. This, however, is 100% new assets and programming on an entirely different engine. The only sticking point is the story, and honestly, the bare-bones plot of Metroid 2 is "You're on SR-388, kill teh 'Troidz!" So yeah, there's a very good chance of this being untouchable, legally, as long as nobody tries to monetize it, what with Fair Use laws. Project M is in a very different situation than AM2R. It is a mod that requires an exploit in order to load, an exploit that has links to unauthorized modification of a console. It also had the unfortunate circumstances of being apart of the tourny in the past such as Big 3, Apex, Evo, etc. As we know, Twitch has become a very big part in the e-sport community and you don't need me to tell you what happens when a channel becomes very popular among viewers. Many of those popular channels — which I won't mention — had streamed PM in the past. When a console mod takes part in e-sport, its legality is called into question. AM2R isn't in a similar circumstances. It a fangame that — aside from using the general road map of Metroid II — uses its own assets and is not being monetized in anyway. There are many Nintendo fangames on the internet and many are still available for us to enjoy. I'm certain Doc knows his limits. 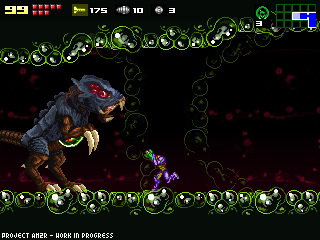 Just found this project while looking for fan-made Metroid games to play (while I wait and hope for Nintendo to release a new side-scrolling Metroid game...) And I gotta say, this is incredible! I've only played it for a little bit, but I wanted to drop this comment off while I was thinking about it. I just found this project, and I am totally blown away by how much work, dedication and obvious Metroid love has gone into this thing so far! Thank You so much. the amount of times ive tried to play the original on gb I found very lacking and lost interest. Ive only played 20mins of your recent demo which I only found out about today and I'm impressed. I use an Microsoft X360 controller and it was vibrating as you progressed throughout the game which is another feature I'm pleased. I look forward to the final product and possibly a future remake of the simular sort.